Use this video window to view the whole series by clicking the playlist button in the corner of the screen. The most common triads are in the diatonic scales. That means that they are in the western major scale and its modes. You could make a chord scale out of any scale you use, but the diatonic chord scale is by far the most used, and it also contains shapes that are used in most other scales, so it’s logical to start here. It’s usually helpful to learn as many chord scales as you can, but every one you learn will open doors musically. On a conventionally tuned guitar, (EADGBE) there are 9 chord scales for the diatonic scale. Three chord scales belong to each set of three consecutive strings. This is because there are three versions of each triad, one in which each note is in each possible position. On a bass guitar or another string instrument where all the strings have the same intervals between them, there are only 3 chord scales to learn because the shapes will be identical on each string; you’d only need to learn how to transpose for different keys and scales. On guitar, because of the major third interval between the 2nd and 3rd string, the chord scales for the 1-2-3 strings and the 2-3-4 strings are unique. The same shapes can be used for the 3-4-5 strings and the 4-5-6 strings because of the fact that there is the same interval between each string (a perfect 4th). Hard to mention triads without this. If you can find open strings that create drones that support a particular key, you can often get some very pretty extended harmonies around playing triads within a chord scale. A lot of great stand-alone chords can also be found using this technique. Combining a simple strumming pattern with a good set of voicings can make good riffs easy to find. This techniques works extremely well with open string boxes, particularly the Open E Box. Choosing a fingerpicking pattern in the style you like can create a unique flavor. 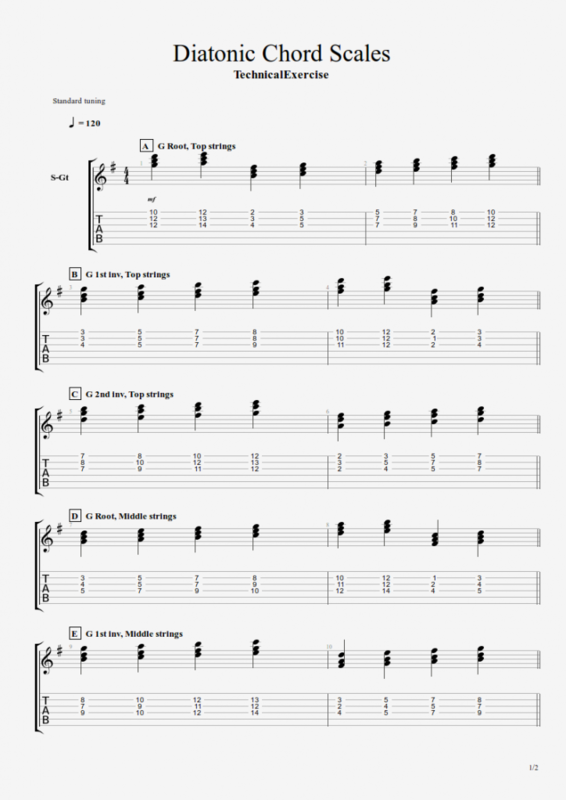 It’s also easy to create hybrid styles by combining chords and picking patterns from dissimilar styles. You can just finger pick the triads and notes around them or you can combine this with the open string boxes to get some very exotic riffs. particularly in Rock and Reggae, R & B and Funk. Using triads particularly in the upper register of the guitar with the right articulation can create a very tight and interesting accompaniment style. The trick is that you need to learn some different articulations like mutes, staccato (short notes), and more complex strumming patterns at higher speeds. 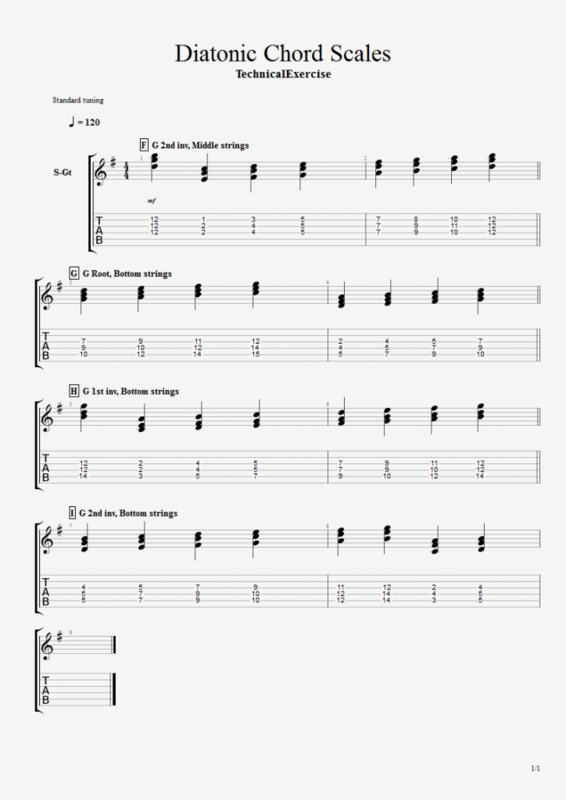 This is a completely essential skill in Flamenco, Jazz, Classical, and Metal. It’s a very classy, catchy, and grounding melodic technique to outline a triad and follow it with scalar motion. This is a very useful way to develop sensitivity to chord tones in an early stage of learning how to solo, but of course this technique still proves very useful when combined with advanced right hand techniques like sweeps and high-speed picking. The triads themselves are quite useful, but they can feel restricting if you don’t have a way you feel comfortable using them. Softer styles will often use consonant extensions of a triad to add color, while harder genres like Jazz, Blues and Metal use chromatic color notes. Jazz and Blues in particular use a riff called the sideslide quite a bit, where you essentially slide from chromatic neighbor notes above or below a target chord. In general, learning any chord system including closed triads or CAGED chords benefits from learning how to find notes just outside of the chord to add as melodic or harmonic extensions. Because the triads move so quickly, they can move as fast as many vocal melodies do. Yet, since they have three notes, they sound like a rich 3 part harmony. Finding voicings that finger well together can let you write some very vocal-sounding riffs, particularly if you use hammer riffs in them. 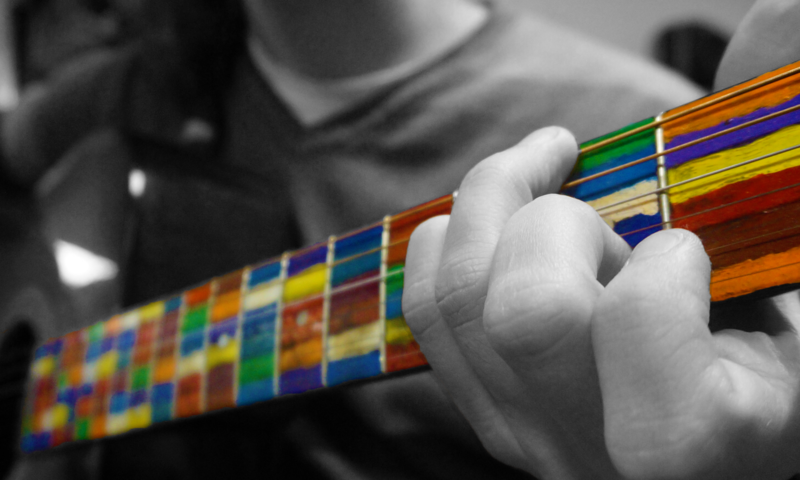 Fingerstyle acoustic, R & B and Jazz will often use exotic chords with altered bass notes. Usually these result from contrapuntal (multi-voice) effects, but sometimes the chords will become a special class of 4+ note stand-alone chords. Refer to this video for more details about altered bass chords.